JUDICIAL Judge Marcus was a Judge of the California State Bar Court from 1995 to 2001, serving as the Supervising Judge of the Hearing Department for the last three of those years. He presided over approximately 160 trials involving such issues as breach of fiduciary duty, fraud, conflicts of interest, the failure to perform competently, misappropriation and client abandonment; wrote lengthy decisions containing findings of fact and conclusions of law for each of the trials and was involved in over 400 settlement conferences with a settlement rate of about 95%. PRIVATE PRACTICE Before his judicial appointment, Judge Marcus was in the private practice of law for over ten years, first as of counsel at Sanger, Grayson, Givner & Booke in Encino and then as a partner at Coleman & Marcus and its successor firm of Coleman, Marcus & Richards in Century City. At all three firms, he was involved exclusively in civil and criminal litigation. On the civil side, his practice included the representation and defense of individuals and businesses involved in contractual disputes, alleged business torts, wrongful death, premises liability and employment issues. PROSECUTOR Judge Marcus began his legal career in 1968 as a deputy district attorney in Los Angeles. From 1983 to January 1985, he was the Head Deputy of the Consumer Section of the District Attorney’s Consumer and Environment Protection Division; in 1982 he was a Calendar and Senior Trial Deputy in the Santa Monica Branch Office; from 1978 to 1981, Judge Marcus was the Deputy-in-Charge of the Beverly Hills Area Office; during 1972 to 1977, he was assigned to the Organized Crime and Narcotics Division and served the last four of those years as the Deputy-in-Charge of the Organized Crime Section; from 1969 to 1971, he was a trial deputy in the Torrance Branch Office and, before that assignment, worked in the Preliminary Hearing and Branch and Area Divisions. During his career as a prosecutor, he tried over 100 felony jury trials. WRITING Judge Marcus is a prolific author who has written about mediations, arbitrations, trial preparation, legal ethics, prosecution discovery and the destruction of evidence for such organizations as the State Bar of California, the California Continuing Education of the Bar (CEB), Los Angeles County Bar Association, Consumer Attorneys Association of Los Angeles, the Association of Southern California Defense Counsel, the California District Attorneys Association, the San Fernando Valley Bar Association and the California Attorneys for Criminal Justice. He is also the author of Trial Preparation for Prosecutors (3d Edit. ), Lexis Law Publishing 2010, and is currently writing California Courtroom Conduct: The Do’s and Don’ts of Litigation for West Publishing. 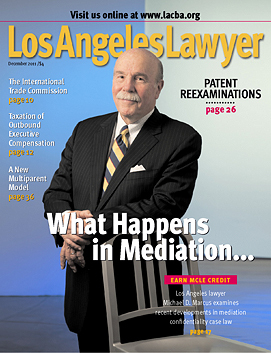 TEACHING Judge Marcus taught evidence at the USC Law Center, has lectured on mediation tactics, strategy and ethics at numerous Los Angeles law firms and has lectured on legal ethics at the California State Bar’s annual meeting, to the California Judge’s Association and for the CEB. He has also been a member of the faculties at Southwestern University School of Law, the National College of District Attorneys in Columbia, South Carolina and was a clinical instructor on litigation skills at the UCLA School of Law and an adjunct professor on trial skills at Pepperdine University School of Law. BAR ACTIVITIES Judge Marcus, throughout his legal career, has been extensively involved in bar activities on the national, state and local levels. In 2007, he was elected to a three-year term on the State Bar of California’s Board of Governors. He is a current member of the Executive Committee of the Los Angeles County Bar Association’s (LACBA) Labor and Employment Section and LACBA’s Professional Responsibility and Ethics Committee. (PREC.) Judge Marcus was the Chair of PREC from 2005-2006. Additionally, he has served as a trustee of LACBA and as a member of its Evaluation of Professional Standards, State Courts, Superior Courts, Judicial Elections and Court Improvements Committees as well as the Chair of its Criminal Justice Section.